Search.texiday.com is the PUP that uses misleading techniques to prevent removal. Use Reimage to locate malicious components and get rid of them faster than with uninstall instructions. A full system scan blocks virus reappearance and prevents traffic to malicious domains. How to avoid getting your web browser hijacked? Search.texiday.com is a website which is associated with Search.texiday.com browser hijacker. This potentially unwanted program (PUP) can be installed with or without your knowledge, however, always WITH your permission. In this article, we are going to explain how this PUP spreads, how it affects the compromised computer and how you can remove it. After entering victim’s computer system, this browser hijacker affects Internet browsers by adjusting their homepage settings. It replaces browser’s current homepage with Search.Texiday.com; because this website looks like any other normal search engine, and it does not raise any suspicion at the first sight, an inattentive computer user might start using it thinking that it is a basic web search engine. Unfortunately, you should not trust the web search service that website provides as it is meant to redirect users to predetermined third-party web pages that Search.Texiday.com PUP seeks to promote. Please remember that these websites might be deceptive or even filled with malicious content. Therefore, to avoid visiting these shady internet sites, refrain yourself from clicking on Search.Texiday.com’s search results or, ideally, stop using this search engine at all. We also recommend removing Search.Texiday.com redirect virus from your computer because otherwise it will be impossible to set another website as a homepage on your web browser. You can uninstall Search.Texiday.com with a help of anti-spyware software, for example, Reimage (PC) or Webroot SecureAnywhere AntiVirus (Mac). Search.texiday.com virus acts like other browser redirect viruses do, for example, Search.shelfsick.com, Search.yourforth.com, or Yoursites123.com (click on links to read more about these browser-hijacking programs). These programs usually disturbs the computer user by popping random ads in new browser windows or tabs, opening websites that user does not intend to visit, or initiate web rerouting. You should replace browser hijacker related search engine with a reliable one, such as Google, Yahoo or Bing. If you notice some unexpected changes on your computer, such as an appearance of a new homepage on your web browser, scan the PC with a powerful anti-spyware program. Always download new programs from trustworthy web pages. Avoid downloading files from websites that are crammed with intrusive ads (especially the ones that trigger pop-up ads after you click on a link or a button on the web page). Install new programs responsibly. Keep in mind that the majority of free software promote additional programs, and you must opt these additions out as they mostly appear to be potentially unwanted programs. You can do that by selecting Advanced or Custom installation mode. These settings provide a list of suggested downloads, so you can review them and deselect the ones you do not want to install. 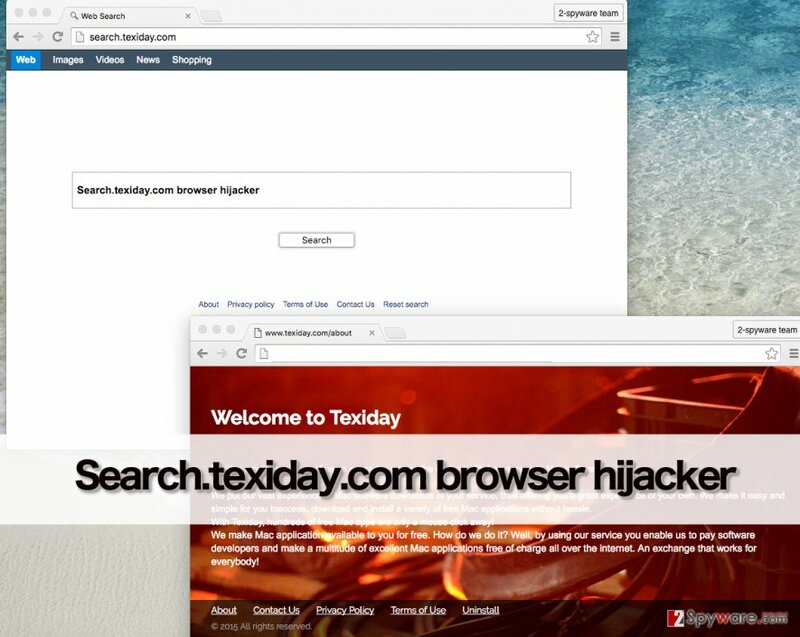 If this software has already affected your web browser and now you cannot change the homepage of it, you need to remove Search.texiday.com browser hijacker from your computer. As we have already mentioned, you can do it automatically with a help of anti-spyware software, but you can also do it manually. Go to page 2 to find the Search.Texiday.com removal tutorial. 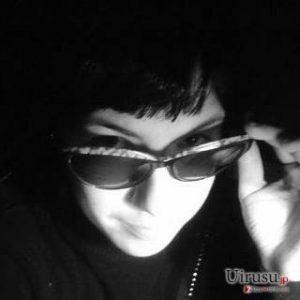 We believe that after reading the description of Search.texiday.com virus, you do not want to use that search engine anymore. You probably also want to remove that threat and all of its components from your computer. Fortunately, it is easy to do it; you can simply follow the instructions provided below this text and remove Search.Texiday.com manualy. Here, look for Search.texiday.com or any other recently installed suspicious programs. Wait until you see Applications folder and look for Search.texiday.com or any other suspicious programs on it. Now right click on every of such entries and select Move to Trash. When in the new window, check Delete personal settings and select Reset again to complete Search.texiday.com removal. Once these steps are finished, Search.texiday.com should be removed from your Microsoft Edge browser. Here, select Search.texiday.com and other questionable plugins. Click Remove to delete these entries. Now you will see Reset Firefox to its default state message with Reset Firefox button. Click this button for several times and complete Search.texiday.com removal. Here, select Search.texiday.com and other malicious plugins and select trash icon to delete these entries. Click Reset to confirm this action and complete Search.texiday.com removal. Here, select Extensions and look for Search.texiday.com or other suspicious entries. Click on the Uninstall button to get rid each of them. Here, look at the Homepage field. If it was altered by Search.texiday.com, remove unwanted link and enter the one that you want to use for your searches. Remember to include the "http://" before typing in the address of the page. Now you will see a detailed dialog window filled with reset options. All of those options are usually checked, but you can specify which of them you want to reset. Click the Reset button to complete Search.texiday.com removal process. This entry was posted on 2016-04-12 at 06:14 and is filed under Stealing programs, Viruses. You can quickly scan the QR code with your mobile device and have Search.texiday.com manual removal instructions right in your pocket. How did you remove Search.texiday.com?